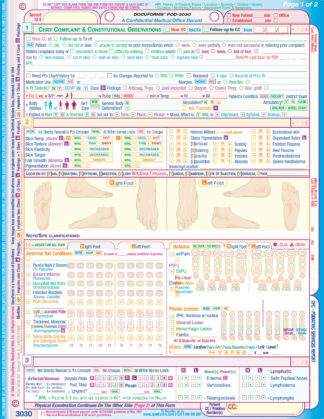 DocuForms’ POD-3010 Podiatric General S.O.A.P Note simply guides you through a S-O-A-P format. It prompts and provides spaces for you to reference dates of prior records, allowing you to maintain historical trail of documentation. 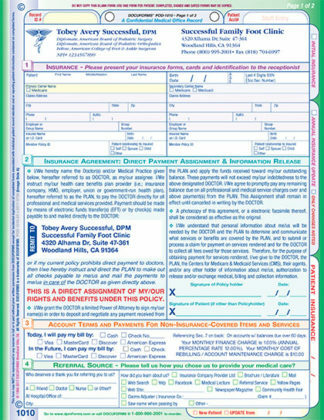 This easily completed form gives you the most freedom, but still reduces writing to save you time and dictations costs. 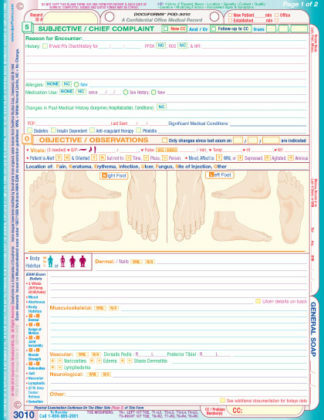 DocuForms’ POD-3010 Podiatric General S.O.A.P. 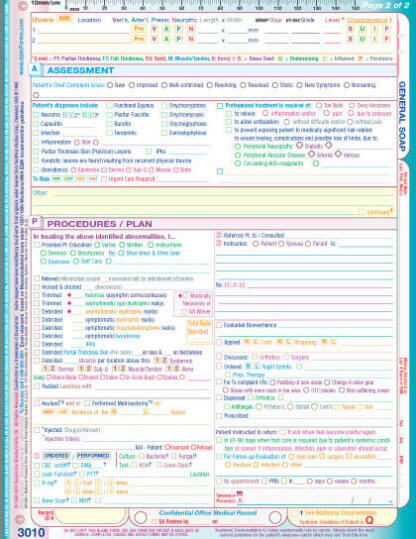 is ideal for standalone use in limited, problem-focused situations, or to be used together with any DocuForms’xexam forms. 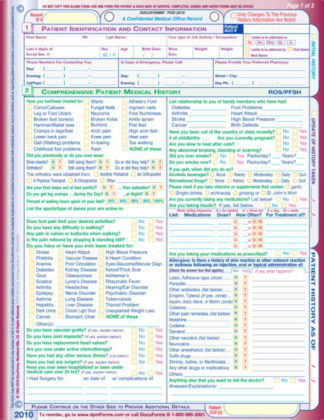 This form may be appropriate when seeing new or established patients and may often be used for follow-up visits. 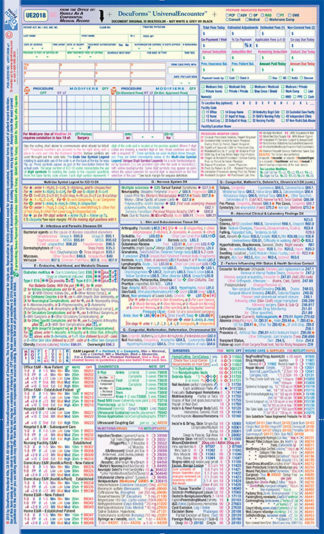 It easily guides you through a S-O-A-P format. The form prompts and provides spaces to reference dates of prior records to maintain your historical trail of documentation. You are prompted for ROS, PFSH and History of Present Illness (HPI). HPU elements are listed at the top edge of the form. The physical findings section includes a list of 19 possible Medicare Bullets/Exam Elements under the 1997 Medicare.AMA documentation guidelines. 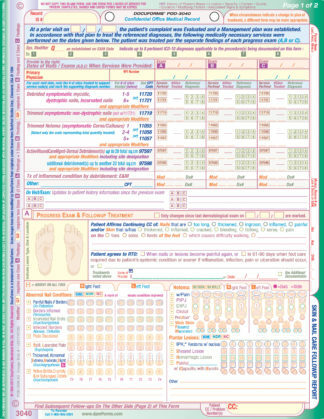 The S,A and P sections of this form, along with the detailed objective findings of a POD-2020 Podiatric Patient Physical Exam comprise a thorough pediatric physical examination. The Assessment, Plan and Procedure sections of the POD-3010 are more extended versions of what is found on a POD-3030 Pediatric Services Report. 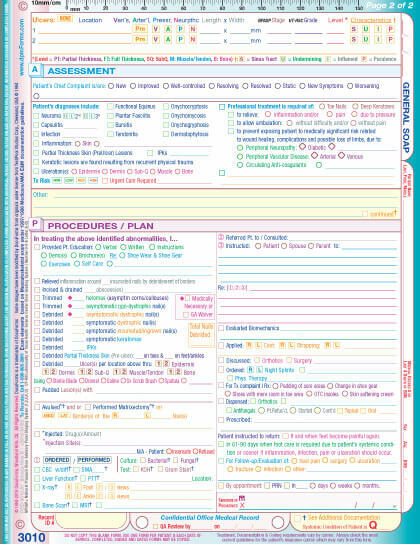 Lines are generously provided throughout the form for recording all relevant details to produce “Individualized” chart notes. This easily completed form gives you the most freedom, but still reduces writing to save you time and dictation costs. The form prompts you to record the pertinent details that support the E&M codes and/or procedure codes which you are billing. These are the details auditors will be looking for. On follow-up visits, check off the box for “Only changes since last exam on __/__/____ are indicated” and then reference the prior exam.